Should Canada abolish its $100 banknotes? When is the last time you paid with a $100 banknote in Canada? Honestly, I can't recall holding a $100 banknote in hand in years. Most of use $20 bills for daily transactions as they get dispensed by ATMs, and we carry $5 and $10 bills as change. Sometimes I find it convenient to use $50 bills, but that is still pretty rare. Of course, most of our payments are made electronically these days using credit cards, or increasingly our smartphones. 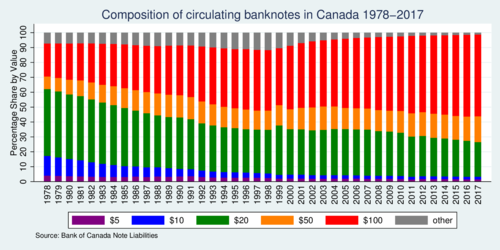 Yet, when we look at the Bank of Canada's banknotes statistics, we see a significant increase in the use of $100 banknotes. 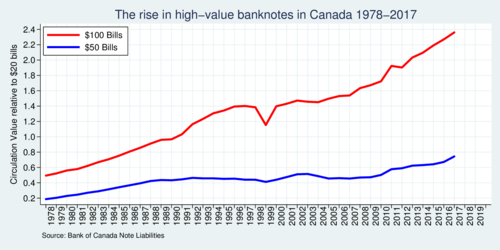 As the first chart below shows, the ratio of the value of $100 banknotes relative to $20 banknotes has increased from about 0.5 in 1978 to 2.3 at the beginning of 2017. So if it isn't you and me who are using $100 banknotes, then who is? You guessed it. The $100 banknote is the instrument of choice of the illicit economy because it is easy to carry and hide. High-denomination banknotes facilitate tax evasion, money laundering, and other types of criminal activity. Still, the Bank of Canada reported in 2017 that 51% of all sales in Canada are still using cash. Other OECD economies use cash much less than Canada. So are we simply a country of old-fashioned technophobes, or do we have a burgeoning underground economy? Because of concerns about counterfeit banknotes, many shops and stores do not accept $100 or even $50 bills. This means that many of us won't even try to carry any of these bills because there is likelihood a merchant will refuse it. Merchants can do so as in Canada because the status of "legal tender" for banknotes leaves the ability for merchants to make an offer to a buyer that does not involve cash, or only certain banknotes. When a merchant displays a sign "no cash accepted", this restriction is a valid form of offering a transaction (the legal concept of invitatio ad offerendum). Counterfeiting has decreased dramatically since the Bank of Canada introduced much safer polymer banknotes as well as various counterfeit prevention safety features. However, the amount of counterfeiting is not zero, and merchants who accept $100 bills run a larger risk than those who don't. The next graph shows how the composition of bills has changed over time. The $100 banknotes in circulation today amount to more than half of all value of banknotes, while in 1978 that number was barely over 20%. This change is not simply the result of inflation. According to the Bank of Canada inflation calculator, a basket of goods that cost $100 in 1978 costs $345 in 2017. This means that there is a trend towards using higher denomination bank bills. At the same time, however, there is a trend towards using less bills overall because of increasing use of credit and debit cards. Presumably, the latter should affect large value transactions more than small value transactions. Overall, the use of $50 bills has not grown that much relative to $20 bills. If inflation was the main culprit, we should have seen a larger increase in the use of $50 bills than the use of $100 bills. So if we can rule out inflation, the logical conclusion is that the rise in high-denomination banknotes is demand for these bills from non-routine transactions. How much money is the Bank of Canada making from printing new bills? 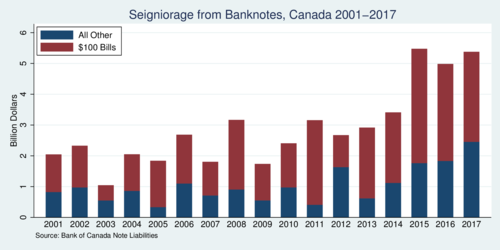 The change from one year to the next in the value of banknotes circulating is the seigniorage, which the chart below has split into the contribution from $100 bills and all other. In the last three years (through 2017) the Bank of Canada generated roughly $5 billion in gross revenue, and even after subtracting its operating cost it amounts to a sizable injection into the federal budget. As the chart shows, the $100 bills account for the lion's share of seigniorage. Losing this seigniorage (roughly $3 billion) would not come easy. A little bit would be made up by higher demand for $50 bills, but there would still be a significant loss. The Government of Canada asked in its 2018 budget to obtain the power to remove legal tender status from bank notes. Curiously, it didn't have this power previously. With this new power the Government of Canada can remove the banknotes from circulation that are no longer produced ($1, $2, $25, $500 and $1,000), but it can also decide to discontinue the $100 banknote. What arguments, if any, can be made to to keep $100 notes? The main argument is that the ratio of bank notes outstanding relative to GDP has remained relatively stable at about 3.5%. But as cash is clearly declining as a share of total transactions, this number should be falling accordingly. It isn't, so its stability must mean that people are using cash for non-commercial transactions or hording. Cash use is falling strongest among the young and the highly-educated. Our future could well be cashless. It is conceivable to institute digital currency accounts with the central bank for each citizen, free of charge, and make balances in these accounts legal tender. It would eliminate seigniorage altogether, which probably won't be popular with central banks. However, the non-anonymous nature of such accounts would make counterfeiting and money laundering much more difficult. The largest denomination in use in the US is the US$100 bill (worth about $133). In the European Union, the largest bill is €500 (worth about $750). The Swiss still issue 1,000 Franc notes (worth about $1,340). Money launderers who find Canadian bills too cumbersome may find easy alternatives elsewhere. So one argument against scrapping the $100 bill in Canada is that criminals around the world will merely shift to transacting in high-denomination bills of other countries. It would need an agreement of a number of countries to eliminate high-denomination bills. Canada's gain could simply be another country's loss. However, getting rid of the $100 bills in Canada would at least put a large dent into our country's underground economy. A problem is also with how large-denomination bills would be phased out. Canada now has the ability to actually cancel notes, rather than simply taking them back through the banking system. This means a date could be announced when large-denomination bills would become worthless—unless perhaps someone can provide verifiable reason to the central bank why they came into possession of a stash of $100 notes. But demonetization may ultimately not succeed in tackling the shadow economy. If there is no cash for the purpose, people may switch to other types of high-value assets (e.g., gold coins, diamonds, etc.) However, phasing out large-denomination bills will most definitely make illicit transactions more costly. India recently abolished its 500 and 1000 rupees bills—which are worth a little less than $10 and $20, respectively—in order to curb corruption and tax evasion. The government was to issue new 500 and 2000 rupees later, but old banknotes needed to be deposited first in a bank account. The move led to major cash shortages and economic disruption, and it is generally regarded to have failed to curb the underground economy in India. The simple reason was that illicit assets were not only held in cash, but also in other high-value assets and real estate. India's move was poorly planned and executed and probably cost the economy dearly. The 500 rupee notes were used by virtually everyone, not just people trying to avoid taxes. Canada, however, is a different case. Nobody uses $100 notes except crooks, tax avoiders, and a few eccentrics. Some economists point to low interest rates and tourism as an alternative answer for the rise in use of $100 notes. I find that a dubious proposition. In a low-interest environment, people tend to flock to investments that have higher yields and dividends, not stash cash. And tourists paying with $100 bills? Their travel advisers will have told them to pack small bills and user their credit cards. A case can be made that there is a net benefit to society from taking the $100 bill out of circulation and demonetizing it rapidly. Fellow economist Kenneth Rogoff has argued the case for abolishing high-denomination banknotes in his book The Curse of Cash. I agree with his conclusions. High denomination banknotes: Cash Talk, The Economist, March 3, 2016. Kenneth S. Rogoff: The Surprising Popularity of Paper Currency, International Monetary Fund, March 2002. Kenneth S. Rogoff: The Curse of Cash: How Large-Denomination Bills Aid Crime and Tax Evasion and Constrain Monetary Policy, Princeton University Press, 2017. Geeta Anand and Hari Kumar: Narendra Modi Bans India's Largest Currency Bills in Bid to Cut Corruption, New York Times, November 8, 2016. Bill Curry: Soaring demand for $100 bills leaves officials perplexed as experts point to crime, tax evasion, Globe and Mail, January 22, 2019. Ben Fung, Kim P. Huynh, and Gerald Stuber: The Use of Cash in Canada, Ban of Canada Review, Spring 2015. Ben Fung, Kim P. Huynh, and Anneke Kosse: Acceptance and Use of Payments at the Point of Sale in Canada, Bank of Canada Review, Autumn 2017.